A new policy for broadcast media in Bangladesh is raising questions about controls on free expression in the country. The draft National Broadcasting Policy for the Bangladesh television and radio media, approved by Bangladesh's cabinet early this month, mandates the formation of an independent commission that will monitor TV and radio news and programmes and a broadcasting law, to be enacted in the future. 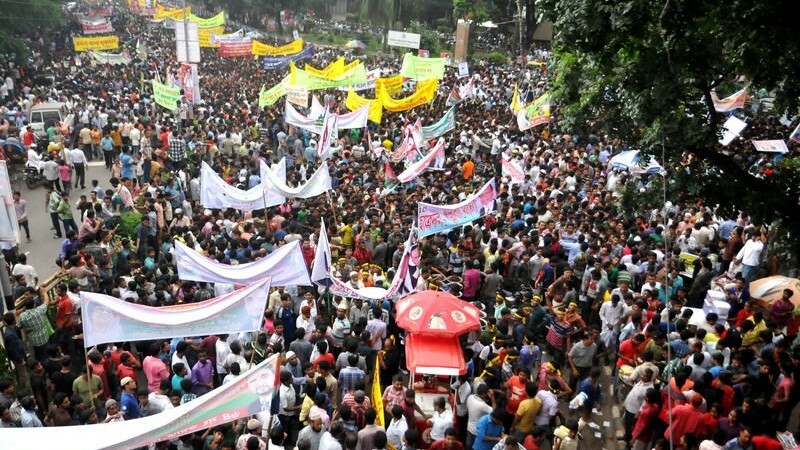 A large political party Bangladesh Nationalist Party (BNP) has dubbed the National Broadcasting Policy as “regressive and intended to gag the media” and organized protest rallies against it. In Bangladesh, there are approximately 24 privately-owned TV stations, 14 private radio stations and a number of community radio stations. The government owns one radio station and one television station. Bangladesh media is generally free although its ranked at 120th out of 178 countries on the Reporters Without Borders Press Freedom Index. The private media is owned by media houses financed by business conglomerates who backs different political parties. In absence of adequate policy and regulatory framework, influential media can sometimes get away with publishing propaganda materials, plagiarism, and even libelous content. This is rarely controlled by authorities, as the judicial process is lengthy, influenced by politics and in some cases corrupt. The broadcast policy talks about restrictions on dissemination of news. The information ministry or any other body of the government cannot dictate what the media will publish, or not publish. …any reasonable restrictions imposed by law in the interests of the security of the State, friendly relations with foreign states, public order, decency or morality, or in relation to contempt of court, defamation or incitement to an offence. The blogger says that the policy deals with the above areas of exception which dictates a plan for forming an independent broadcasting commission. The commission will confer with all media sectors, including consumers, to audit unjust and unfair broadcasts and provide remedies for breaches of the law. The current government was reelected in a questionable election and there are concerns about its legitimacy. So this government needs more such laws and policies to control situation. [..] They keep their weapons ready to confront all kinds of negative criticisms. This policy is one of such weapons. Journalist Mizanur Rahman also suggests in the Bangla daily Prothom Alo that the policy is intended to shield certain authorities from hard criticism and condemnation. However, Information Minister Hasanul Haque Inu differed, arguing that the budding broadcast media in Bangladesh is not properly regulated due to outdated laws, rules and regulations. He believes the policy will help to update and modernise the regulation of the industry. Blogger Firoz Zaman Chowdhury reminded readers in an old post that private TV stations have been operating largely without regulation since their rise. After the approval of this draft policy in the cabinet, heavy debate ensued on social media. Those with connections to the media industry mostly expressed their concerns. On Facebook, journalist Amin Al Rashid wondered why this draft policy was not widely publicised and debated by media before approval. The media industry is now very concerned about the draft policy.. so why didn't they publish series of reports dissecting every section of the policy before it was approved?.. That would put the government under some pressure and they would analyse and revise before the approval…It is better to prevent pulling the trigger rather than trying to retrieve the shot bullet. Tomorrow 9th of August is the UN observed International Day of the World's Indigenous People. A directive sent from the ministry of Information instructed to avoid the word ‘indigenous’ for the small ethnic communities of Bangladesh in different districts. What a strange request! You cannot call them indigenous on the International Day of the World's Indigenous People but small ethnic community or minorities. There have been several efforts to control the media in recent Bangladeshi history. In 1974, all but four of the country's newspapers were shut down. A number of media organisations were shut down on several occasions for different reasons – Ekushey TV in 2002, Channel one in 2010, Diganta TV in 2013 and Bangla Daily Dainik Amar Desh in 2013. In 2013, the government passed a series of controversial amendments to the nation's Information and Communication Technology (ICT) Act that increased criminal penalties for Internet-based media under the law. The law now codifies arbitrary, warrantless arrests and detentions of suspected offenders. According to recent reports, a draft of the National Online Media Policy 2014 is largely in line with the broadcast policy. Under this policy, online media will be required to obtain a licence from the government for a hefty fee. It will also prohibit reports and write-ups that mock or demean persons of the armed forces or other law enforcement agencies. The policy may also place a ban on reporting incidents involving politically-motivated rebellion, anarchy and other such harmful activities. Supreme Court lawyer Yunus Ali Akand filed a writ petition in the Supreme Court on Aug. 18 to annul the said broadcast policy.